As the FIA World Rally Championship (WRC) embarks on the season finale at Wales Rally GB, the Qatar M-Sport squad will be looking to deliver a strong result. Having amassed eight podium finishes throughout the course of the 12 rounds to date, the UK-based team will be determined to add to that tally next week. As an event which favours both the team and their young crews, the Welsh fixture holds a promising prospect for Qatar M-Sport. Returning to its traditional season-end slot, the rally is famed for its fast, undulating forest stages which are made all the more challenging by a constant threat of rain, fog, ice and even snow. Although the season-closing date may be familiar, the event is all change. Having previously been based in Cardiff, this year will see the rally venture north to Deeside. The North Wales location brings with it an added test as over 50 per cent of the stages are either brand new, or not used in the championship for more than a decade. One driver who knows how to tame any challenge thrown up by the Welsh forests is Qatar M-Sport World Rally Team’s Mads Østberg. Having tackled the event on seven previous occasions, it is fair to say that the Norwegian considers Wales Rally GB a home-from-home. The 26-year-old – who is partnered by Swedish co-driver Jonas Andersson – also knows how to get the best out of the Ford Fiesta RS WRC through the forest tracks. Indeed Østberg aided a clean sweep of the podium for M-Sport in 2011 when he piloted his Fiesta to an impressive second place overall. Equally versed in the demands of this specialist event is Østberg’s Qatar M-Sport World Rally Team team-mate, Evgeny Novikov. This will be the Russian’s fifth appearance in Wales having made his WRC debut on the event in 2007. Novikov’s best result from the rally is sixth overall, but he and co-driver Ilka Minor will be looking to improve on that as they focus on continuing what has been a streak of top-five results behind the wheel of their Fiesta RS WRC. Also making his fifth appearance at the Welsh fixture is Qatar World Rally Team’s Nasser Al-Attiyah. Partnered by co-driver Giovanni Bernacchini, the Qatari knows what it takes to master the Welsh conditions having secured a podium finish as part of his pre-championship winning year in the then P-WRC series in 2005. Needless to say, Al-Attiyah will be looking to finish his season on a high and is more than capable of piloting his Fiesta RS WRC to a top-five finish. Despite being the crew with the least amount of experience in Wales, Qatar World Rally Team’s Thierry Neuville and Nicolas Gilsoul should not be discounted for a strong result. This will be only the second time that the Belgian does battle with the Welsh forests – and the first time behind the wheel of the Fiesta RS WRC – but that has not halted his pace in the past and Neuville will be going all out to finish his impressive season on a high. Of course there is one driver in the Qatar M-Sport squad for whom a lack of experience in Wales poses no threat – local boy Elfyn Evans. Returning to the Ford Fiesta R5, the Welshman will be a real contender for victory in the WRC 2 category. Making his WRC debut at the event in 2007, Evans piloted a Ford Fiesta ST to class victory and will be looking to repeat that feat next week. Partnered by co-driver Daniel Barritt, this will be Evans’ third appearance on the event, but his local knowledge is sure to give him a strong advantage when it comes to taming the unpredictable nature of the Welsh terrain. “I think it is fair to say that Wales Rally GB feels a bit like home to me. The roads and the surface are very similar to what we see in Norway and I have been here many times before which always helps. It is definitely one of my favourite events of the year. “I started my WRC career at this event in 2007, so it holds a lot of good memories for me. I have also competed here quite a few times before and this year I want to secure my best result from the event. Ilka [Minor, co-driver] and I have had some good top-five finishes recently, and we want to continue that in Wales. “I am really looking forward to this event and for the Qatar M-Sport teams to end their season on another high. This is an event which suits the [Ford] Fiesta, and I hope that at least one of our crews will be on the podium come the end of the rally – that would be the perfect way to end what has been a very encouraging season for Qatar and M-Sport. “Our main aim for this rally will be to finish strongly and secure second place in the drivers’ championship. 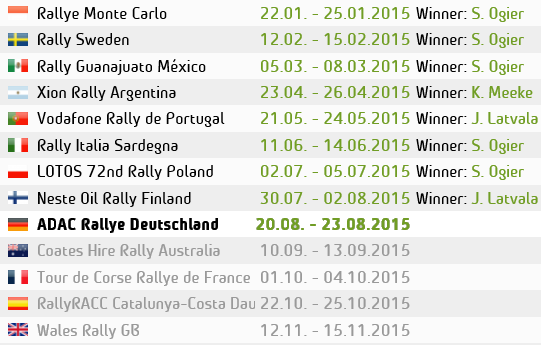 Of course our plan was to win at least one rally this season, but we have not achieved that yet. With that in mind, I would like to be in the fight for victory next week and it would be great to finish the season with another podium for the team. “I have some good knowledge of next week’s stages, but admittedly some more than others. I think Thursday and Sunday will be new for almost everyone, including me. One day I will know that perhaps others won’t is Saturday – hopefully that can be a really good day for us. “Ultimately however, it is the weather conditions which pose the greatest obstacle. If we have the usual rain and fog it will be very challenging – especially on Thursday’s night stages which are particularly narrow and relatively unknown.